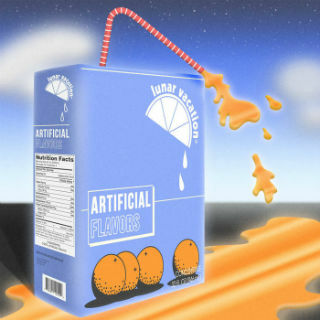 On July 6 Lunar Vacation released their second EP, “Artificial Flavors”, to Spotify, Bandcamp, iTunes, Google Play Music and Deezer. The passivity of their previous EP “Swell” gives way to new boldness in Artificial Flavors- from the brighter colored album cover, with defined lines and surrealistic subject matter, to the music itself, which contains jabbing commentary in the lyrics as well as a new, more electronic sound and sampling. From beginning to end the EP's narrative-like structure takes you through the Jekyll and Hyde of the day versus nightlife of a high schooler in a way that’s reminiscent of F. Scott Fitzgerald’s “The Great Gatsby", though instead of sky rises in New York City, you find yourself in the basements of suburbia. In a story that is timeless in nature, Lunar Vacation captures the feeling of being within and without of the ‘in-crowd’ simultaneously, all while trying to earn the love of someone inside it, including references to local Atlanta scenes, house parties and social media along the way. The story would not be complete, though, without the proper setting, which is created through the use of contrast. While Grace’s vocals remain as ethereal as ever, and John Michael and Connor’s beats steady, Matteo takes more of the stage on the keys and Maggie’s guitar playing takes on a more upbeat role, changing the tune from the beachside ensemble of previous EP Swell to a late night arcade. Lunar Vacation has created a digital world for the vocals, and the subject, to seem just enough out of place to drive the theme without sacrificing their synchronicity. Artificial Flavors seems to have achieved the ultimate feat that comes with new music: changing enough to add interest without compromising originality. The band has maintained their dazy, surf-punk vibe that makes them so unique while new elements merely enhance what was already there.